As if we lived out in nature, the venue that is Melkweg is surrounded by water of the canals in Amsterdam. This venue proves to be one of the very best I’ve seen Mew in. Melkweg has a bigger (The Max) and a smaller (Oude Zaal) concert hall and Mew plays in the latter. Tonight is sold out. Oh see them fast, take off at last – no time for support acts this evening. The place is filled when Silas Graae walks onto stage. 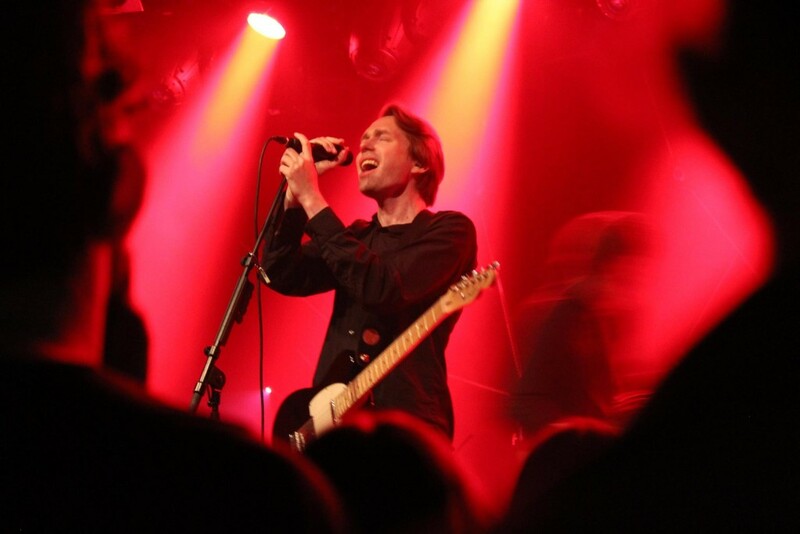 After a rather different setlist the night before in Paris, I’m certain Mew are back to the ways of what seems to be the preferred songs for this tour. It’s a bit of shame, but I don’t care at the same time. I experience something very rare tonight. Silas seemed to drop his drumstick during a song, but if there’s a glitch, he always makes it work anyway and not many people seem to notice. It reminds me of a gig in Denmark – Slagelse Open Air, July 1, 2006 to be precise – where Silas’ bass drum pedal fucked him, and it resulted in a thrilling alternative 156 chorus played on toms. These small mistakes have become loved small tales that many frengers love to speak about. In essence they are good stories, because they are so rare. Another favourite of mine was that time when Jonas Bjerre stopped after having made his way through one verse and chorus of Snowflake (The first show in Operaen, Denmark, 28 November 2010) just to find out he was singing in the wrong key. The few troubles for me this evening are the same old. Could you foresee a day, they might not play Am I Wry? No and 156 in succession etc.? Jonas’ voice did start to bear a slight mark of the heavy touring, but three does certainly feel like the lucky number of the concerts I’ve seen this time. Besides the audience response, the stage has the perfect dimensions for Mew’s new light setup. It covers all of the black stage and resembles the Satellites video experience very much. It’s more central. And colourful. It’s the way you want to see Mew without the animated visuals. For such a long time I didn’t know if I’d be surprised this evening, but as Mew leaves stage after the medley, I look through the setlist. I’m actually uncertain what they’ll play next. My Complications has already been played. Perhaps Hawaii or Eight Flew Over, One Was Destroyed then? Bo Madsen says that they probably do not play the next song as often as they should, and that the song was written while he was on vacation. That must be Hawaii then, I think, and yet they manage to pull the carpet from under me. The song is She Came Home For Christmas. I’m not sure when they played it in its full band version last time, but I can’t remember watching it since that before mentioned concert in Slagelse in 2006. A real surprise to find it on the set list. Now the lights are off, and it’s time to finish up the concert with Comforting Sounds and by the time it’s over I’m happy again. For a while. It gets me thinking a bit later. It annoys me that I won’t be going back through all those old memories by Jonas’ command of the microphone again for a while. I’m in a car headed back to the apartment of a frenger that once again lets me stay on her couch besides being the reason I was in Melkweg at the first place. How many people my age has a vast network across the world with couches and lovely people to stay with? I feel fortunate, and at the same time I don’t want it to be over for now. It can’t be! And so I’ll just sit here listening to the drums of the missing Rows until Roskilde Festival.